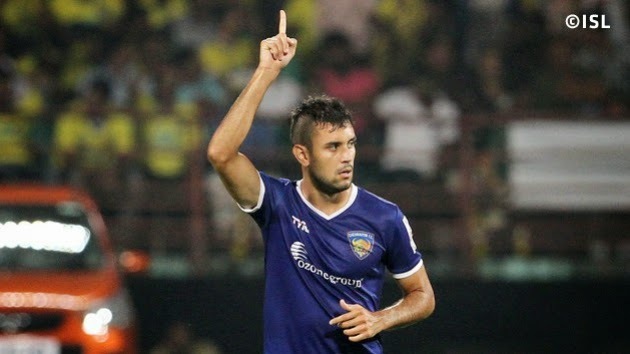 Second half substitute Bruno Pelissari produced a late moment of magic to help league leaders Chennaiyin FC beat Kerala Blasters FC in Kochi by a 1-0 margin and extend their lead at the top of the Hero Indian Super League. With this win, Marco Materazzi’s side, who logged 22 points, move five points clear of second placed Atlético de Kolkata. The first home defeat leaves the hosts at fourth place with 15 points. Chennai emerged victorious for the second time in what was dubbed as the south Indian derby having won 2-1 in Chennai earlier. With over 60,000 fans behind them, Kerala were favourites to win tonight but the visitors were clearly the better side on the night.